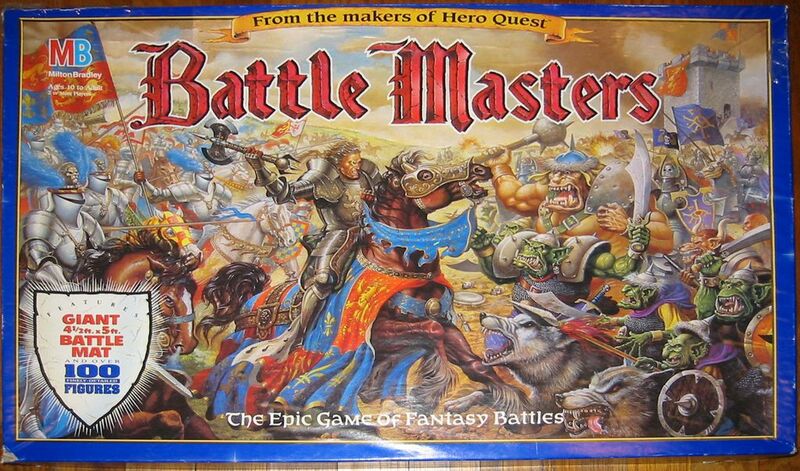 After the success of Heroquest and Space Crusade, Milton Bradley Games published the third game designed by Stephen Baker based on the Warhammer universe(es) - Battle Masters - in 1992. The game is incredibly simple, each player draws a card from a deck which determines which of its units may move or attack in their turn. 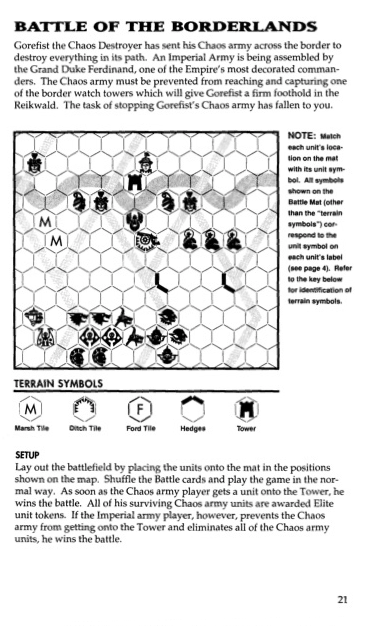 There are no rules for terrain and troop types have basic differentiating abilities, some will move more or less often depending on the activation deck, and some will attack/defend with between 2-5 dice, and some can deal damage at a distance. The rulebook is freely, and legally available from Hasbro. Not convinced? Maybe this pre-millenium capitalist propaganda featuring childrens gleeful faces, superimposed explosions and LARP goblins will convince you. Now despite my love for all things detailed, clunky, overcomplicated and simulationist, from Oldhammer to Laserburn to Phoenix Command, I'm also aware that these are only flavours - aesthetic choices and by no means the one true path. 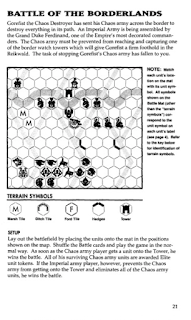 Having been idly tinkering with an extremely rules-light wargame on and off over a few years, I though it might be interesting and informative to examine someone elses approach to resolving a fantasy mass battle. While the rules are lightweight, the original game came in a great big heavy box crammed full of monopose plastic early 1990s Citadel Miniatures and multicoloured illustrated cards for movement and a massive play-mat for moving them about on. Notably the artwork on the box cover was created by the mighty Fangorn aka Chris Baker a name that goes right back to the very earliest days of White Dwarf, and Games Workshops British Edition of Dungeons & Dragons. Despite it's creative pedigree the 1990s full colour artwork and the fourth generation regurgitation of fantasy tropes that had been mainstreamed for about 20 years isn't ever going to float my boat, and I've no intention of hanging around on eBay waiting for the game to drop so I decided to take the essence of the game, strip away the products marketing reliance on overly elaborate plastic toys, and make it something a little more like an Avalon Hill hex-and-chit wargame, or something like Steve Jackons Ogre: Pocket Edition or the soon to be re-released The Fantasy Trip or perhaps even Gregg Staffords White Bear and Red Moon, in an attempt to take Battle Masters right back to the origins of fantasy gaming, and make the game itself more accessible. Originally the aim was to get everything on a singe A4 sheet, as this would have been the most simple, econmical and accessible format to produce it in. However, it quickly became clear that there were too many components, so it's ended up as 2 sheets of A4. The Map has been rendered to only show terrain features that effect the game. It is peculiar that the paths, woods and hills don't add movement bonuses in the rules, perhaps something to be added in to an Advanced edition further down the road. 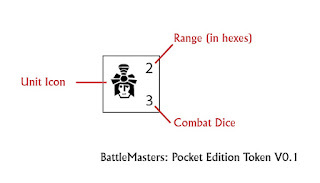 The Unit Token carries 2 stats, the number of attack dice and the range (if any) that the weapons can fire - the head icons are very roughly drawn and based on the original Battle Masters set, I was tempted to replace these with letters of the alphabet, but wanted to keep some reference to the original game. The Dice: Normal D6 - Attack Dice score on a 4-6. Defence Dice score on a 6. You'll notice these are the same odds as represented on the Skulls and Monster Shield on the Heroquest dice, but you'll need 6 of them in your dice cup. Wound Markers : I haven't added any wound markers, as I plan on using small pieces of red paper, possibly made using a holepunch. And there you have it, a bare, minimal set-up that already improves on the original by removing visual noise that has no meaning in the game (unit shield icons, terrain features), and putting more data which aids play (the range of shooting units) directly in front of the player. 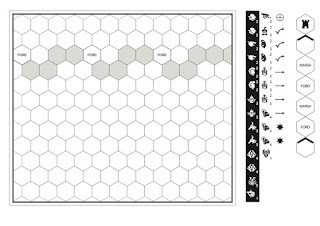 You can download the 'playtest' version of Battle Masters: Pocket Edition print and play it yourself - along with the simple map-board and icons there are also the Battle Cards you need to decide which units move. If you do give it a go, any feedback would be much appreciated! Meanwhile I am going to play through and write up the short campaign of 5 games included in the original Battle Masters rulebook, starting with Battle on the Borderlands with an eye on four things - does the prototype physically work, what problems arise from the format? Does the game itself play well, where is the ludological/strategic expression/interest located? 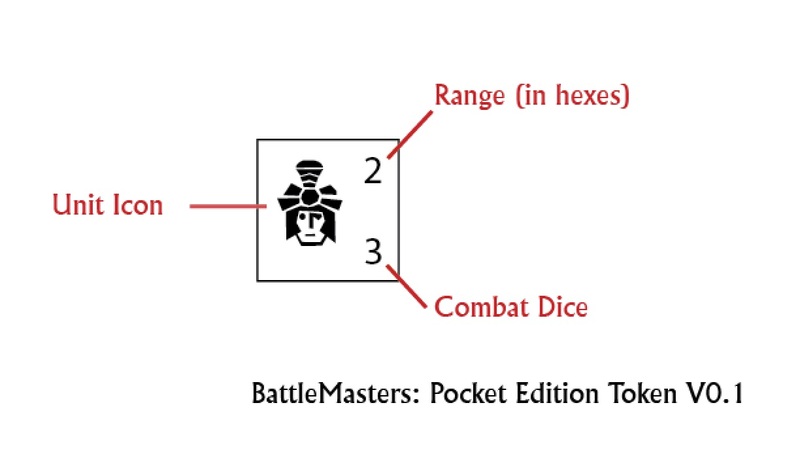 What ideas for a potential "Battle Masters: Pocket Advanced Edition" arise? And what, if anything, can be taken for my own rules-light game. The starter campaign itself chronicles the invasion of The Empire by the mighty Chaos Lord Gorefist the Chaos Destroyer vs the Imperial Lord Grand Duke Ferdinand one briefly wonders if this is some thinly vieled reference to Archduke Franz Ferdinand III of the Austro-Hungarian Empire, and Gore Fist to Black Hand - the Serbian nationalist organisation who assassinated him. I doubt that much thought went into it, besides the Austro-Hungarians invaded Serbia, not the other way around. Nonetheles, once you scrape away the fantasy facade and replace the word 'crossbow' and 'archer' with 'heavy artillery' and 'artillery', consider the river as the Danube front, there's a WW1 Serbian Campaign game hidden just there. Does make one wonder what else might lurk beneath the surface. Nice idea. I had the original set back in the day but the size of the mat made it a bit of a ball ache to play!. Great way to get loads of cheap minis though!. 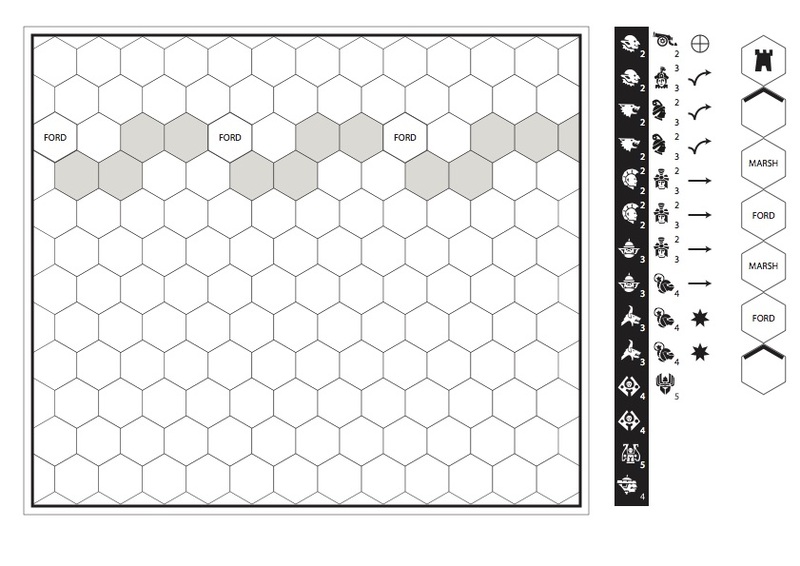 I do think the system will lend itself well to the 'avalon hillalike' idea and prove a nice portable game. i will be following with interest. Thanks Sprinks. yes, small, compact and portable is definitely where I want to go with this! Great post! I am really looking forward to giving this a bash. Hey hey! I do hope you let us know how it goes! This project is great, please keep it going! Thanks! I'll certainly endeavour to keep going on it. I just watch the advertisement video. I had never seen that before. It's actually really well made, though sadly lacks any classic lines such as: "I'll use my broadsword!" I do like: "FROM THE MAKERS OF HERO QUEST!!!" at the end, though. "In the land of Molgar for the River Quell..."
Hey! This is the Reikland and the river is the Tengin! Tempted to start referring to The Empire as "Land of Molgar" and anything vaguely Fantasy-Landsknecht as Molganese from now on. I'm listening to it again and it might actually be "Moldar". Sounds suspiciously familiar. "In the Land of Moldar where the Shadows lie..."
"One does not simply walk into Moldar..."
You might be right, "Moldar." To win back the land and the ancient tower." Versus knights and archers and the canons roar. It's good versus evil on an epic scale Battlemasters! (from the makers of Heroquest)". It's even worse verse when written down! Funny about the Moldanese Empire "reclaiming the land" as the game posits the situation as an invasion by the Chaos horde. Damn those border disputes. It's interesting how in the land of Moldar (Moldaar? Moldarr? Mol'daah?) the "Ancient Tower" is implied to be some major landmark of supreme cultural, magical or religious significance and its recapture is apparently the objective of the campaign...when in reality (that is, the actual game-world, as opposed to the advertisement) it's just one of many watch-towers that protect the borders of the Reikland. Here's a more accurate verse! The evil Gorefist and his mighty horde!" The advert certainly conveys a more mythic, dynamic and interesting setting than the game provides, even if the poetry is awful. "Mol-Daar" has a certain 1970s barbarian comic book charm, as does the "River Kwell". The ancient tower is much more evocative than a simple military garrison. It's interesting that the advertising company jettisoned the entire GW background and Chaos all together and instead focus on the more on brave knights vs. Tolkienesque Orcs, Goblins and Wolfriders for a broader appeal. I'll have to take a look at Memoir 44 at some point to see if anything can be borrowed or stolen for BattleMasters: Pocket Advanced - thanks for the tip-off.